I think there will be conflicts with #278. We'll need to reconcile the changes in your and @charjac pull request to minimize the duplicated work. Api is ready to go. Fantastic, thank you for your contribution. I will test it as soon as possible. I'm not sure I need to look into why this works. @martpie came up with this. See this issue on mpris-service. JSBI ships with a .mjs version of the library. The thing is Webpack's electron-main will try to import this .mjs instead of the classic common JS file. Then things goes terribly wrong. To me, this solution is a hack, but I am not sure if the problem comes from jsbi builds, or node-dbus-next (which seems to be written in cjs, but without a transpiler/bundler). I am also looking for a better solution, but I can't manage to get this library working is the first place 😄 so this is not my top-priority. I was just looking for a program to use mpris from the terminal, and found playerctl. Only after reading the readme and clicking the author's profile did I realize that it's you. Small world, or maybe you're just the most prominent in that niche. I also found out that dbus doesn't play nicely with tmux (apparently this combo causes an invalid socket location being saved in the environment, breaking playerctl). This occurs on launch and is apparently caused by dbus-next, although it might be something on my end. Yep, it can't connect to dbus at all. Ah ok you're running a code path I haven't tested in dbus-next. What is the value of $DBUS_SESSION_BUS_ADDRESS? I can reproduce this by launching a shell with dbus-launch which uses the abstract socket scheme by default (dbus-launch /bin/zsh). I'm pretty sure this is a problem with electron disabling some node api for the filesystem. GPMDP works ok with the abstract socket code path, so that's promising. I'm trying to see if there are differences in the webpack or electron configuration that get this to work. 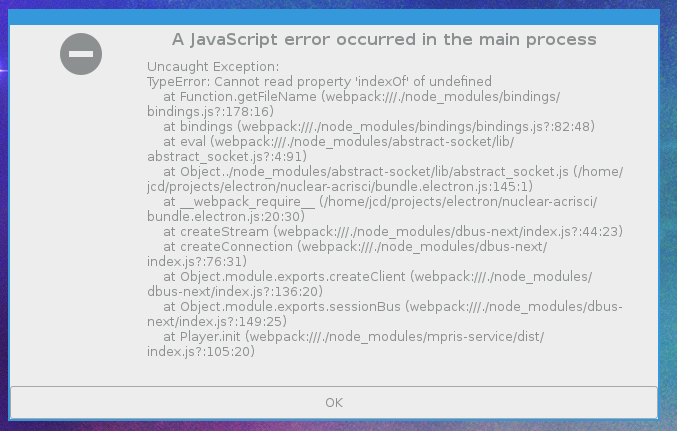 The origin of the error is here within the node-bindings library, a dependency of the node abstract-socket library. They are trying to get the name of the file to find the abstract-socket bindings using the node Error class and getting a stack trace. However, the stack trace object (st[i].getFileName() below) is returning undefined so it can't build the search path properly. I think if this function worked, then this bug would be fixed. That allows fs to be used, but still doesn't resolve the issue so there might be more to it. Ok, so the real issue is that abstract-socket and bindings cannot be put in the bundle because the logic to find the bindings depends on the location of abstract-socket within the node_modules directory. And you can't include the compiled file in the bundle anyway. I wish we didn't have to include this compiled file, but nodejs does not natively support abstract unix sockets so I don't see a way to write this dependency out. This fixes the issue, but I'm not sure what the implications of using externals in the webpack config is. I hope this doesn't put you in a bad spot. Does this work when we build the whole program in an Appimage, snap, etc? The whole problem with native dbus implementation was that it was impossible to bundle it correctly for these build targets, and it caused more trouble than it was worth. I'm fine if we have to use some black magic to get it to work, I'll test it later today.